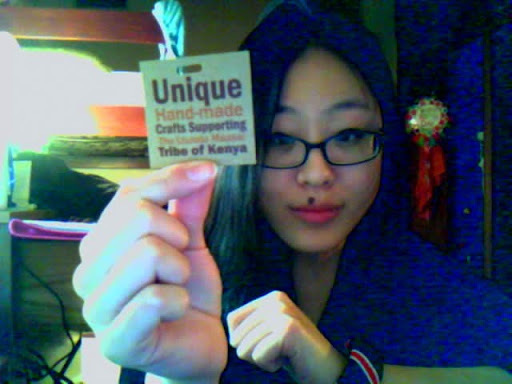 I'm really excited to present the Maasai Made: The Kenya Project! They just had their product launch this past Thursday. I believe that this project is very exciting and has a lot of potential! Especially since it is so close to home, launched and organized by a group of Marymount students with the assistance of the dean of the school of business. "Maasai Made is a project initiative that is taking place at Marymount University. The objective of this project is to make hand-made crafts available to the public for purchase. The jewelry is made by a very talented tribe in Kenya, the Lturoto." 100% of the sales go back to the Lturoto tribe. One of the students at Marymount is actually from this tribe. The Lturoto tribe is nomadic in nature, and by purchasing products from the Maasai Made project, you can support there lifestyle and give them opportunities to purchase water and other necessities. They primarily have jewelry, ornaments as well as key chains for sale right now. My favorite jewelry piece was definitely the bangles, which I bought and love wearing!! They're pretty fashion forward and very easy to match with your every day look! Also, every jewelry piece or accessory is one-of-a-kind so you know you are getting a unique jewelry that is both charming and for a good cause! Ps. Thanksgiving is tomorrow! What are you guys up to? Wow, the jewelry really is amazing! I've heard about this, great cause! thanks for your comment babe!! Am DEFINITELY following you back!! Have a great day! Oooh how lovely! Definitely share the website with us once it's up & running! I'd love to purchase some stuff.